WASHINGTON, March 13 -- The ongoing bailout of insurer AIG and its counterparties was apologized for but defended by a range of Obama administration officials this week. Treasury Secretary Timothy Geithner, until recently the president of the Federal Reserve Bank of New York and before that at the IMF, said he hated to have to bailout AIG, but "it's systemic." 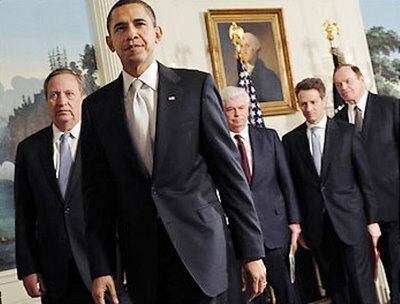 Friday in the White House Barack Obama met and then faced the Press with Paul Volcker, chairman of the Federal Reserve in the time before Bill Clinton. Volcker rarely used his regulatory powers, at least not to protect consumers from predatory lending. And yet now these are the people, along with Clinton's Treasury Secretary Larry Summers, who are defending massive transfers to Citigroup and AIG, all the while laying blame everywhere except upon themselves. You have the transcript from the Oval Office remarks by the president and Paul Volcker. Here's a postscript: As we were leaving, Mr. Obama asked, "How's Gibbs doing?" "Great," came the reply. "Not too bad." Mr. Obama's advice to the press: "Take whacks at him." Footnote: Gene Sperling, recounting his time as an advisor to the TV show "The West Wing," said without irony that "We don't have to rely on President Bartlett anymore -- we have Barack Obama!" He said that securitization is "part of the solution." Certainly that's music to the ears of Citigroup and AIG, Goldman Sachs and Morgan Stanley. One wag wondered, concluding the week in DC, it is Gene Sperling or the Twilight Zone's Rod Sterling?